A Healcrest Farm to do list. I thought it would be of interest to know what it takes to get an urban farm up and running in the spring (and maybe overall). Volunteers keep your ears perked! Some of course are long term goals and some short. Clean up the spiral garden – this may actually happen tomorrow! Get electricity and figure out how you are going to afford the bill! Make nice with the greenhouse snake – may she mash out all the potential rodents. Lay out good strong plans that bring in good big grants and solid, long-term partnerships – sounds like real life. In between it all weed out the overgrowth, the poisonous, the unusable….this will keep you focused on the fruit of your labors. 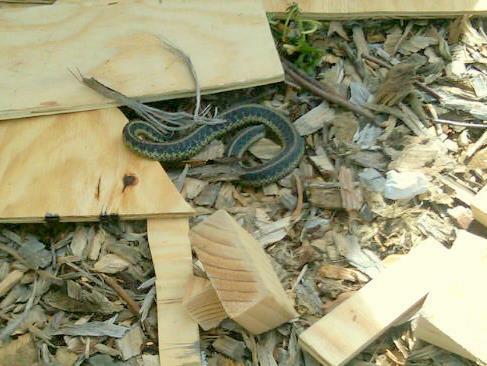 By the way – this is the greenhouse resident garden snake. Keep her peace and your distance – she has an important job. 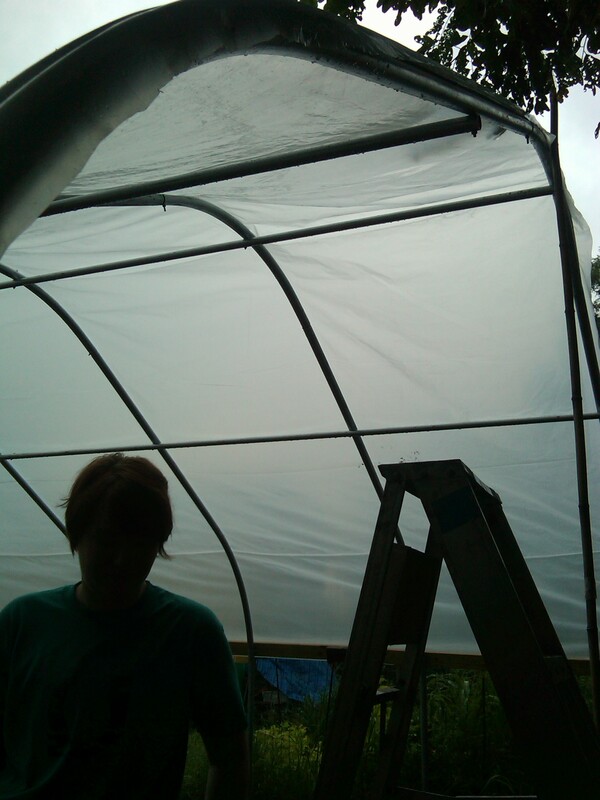 My hands have scratch marks the length of pens and I look like I crawled under barbed-wire, but aaah the greenhouse is up and almost running! Such a big step for Healcrest. Niko did a fine job on the end walls and my scratches are due to placing poultry wire along the length of the interior, unfortunately in an attempt to keep out those wanting to thieve our future produce. I hope no one endeavors, but if they do I hope it is because they really do need food. We are definitely in need of volunteers this coming week to help do this list – check it out and see if you have a little time to support your local urban farm…. Organize the shed!!!! We would all function better if it was kept ORGANIZED – ok nevermind -I will be responsible for this. You know if you volunteer a minimum of 2 hours per week – you take home veggies when they are in season – right now you could be enjoying asparagus, thyme, sage, lemon balm, chives, and heirloom onions! 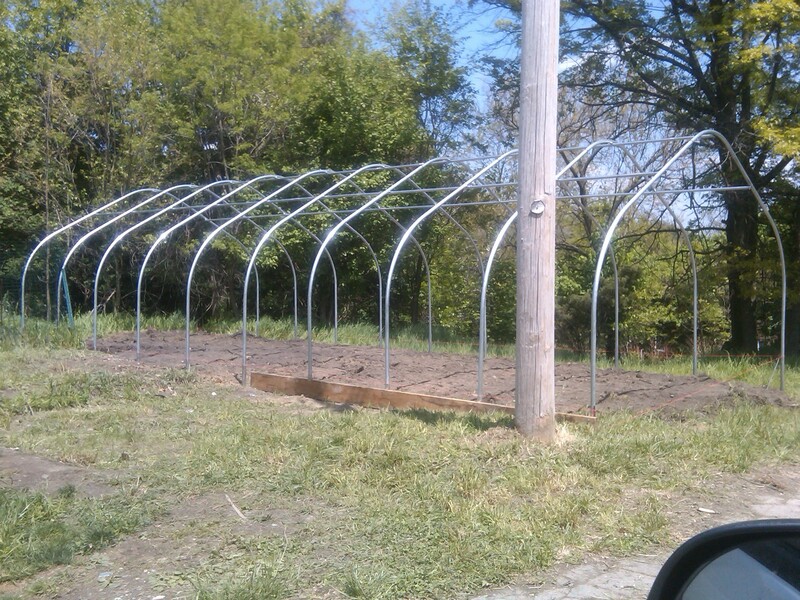 Soon you could also be enjoying, rasberries, strawberries, okra, collards, cabbage, tomatoes, peppers, squash, pumpkin! 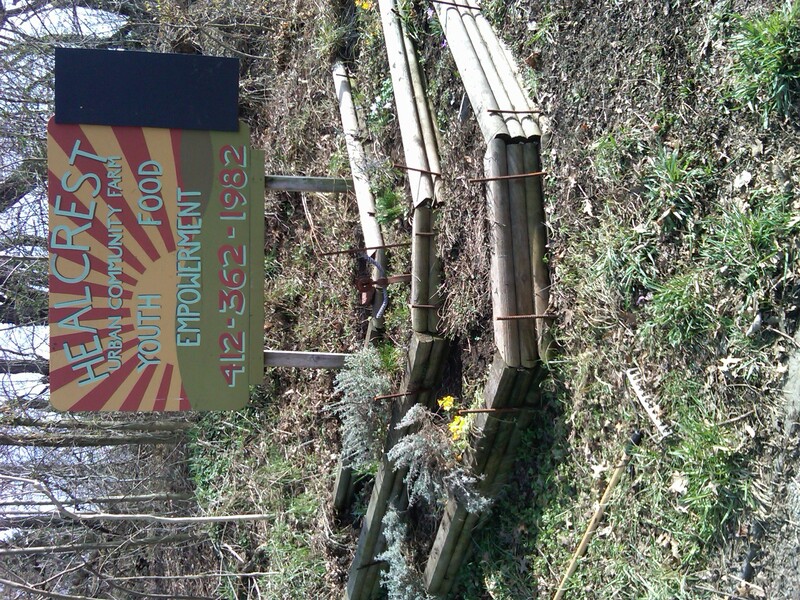 So big thank you to our Contractor extraordinaire and Pittsburgh Community Services Incorporated (http://www.pghcsi.org/) for sponsoring our greenhouse and new Roots Women garden! It has been quite a time getting the Farm ready with a 6 month old. I had him on my back yesterday in the sling and he is so active that while trying to hold him still I jammed the pitchfork right between my toes – yes everyone I did NOT have work boots on yesterday!!! 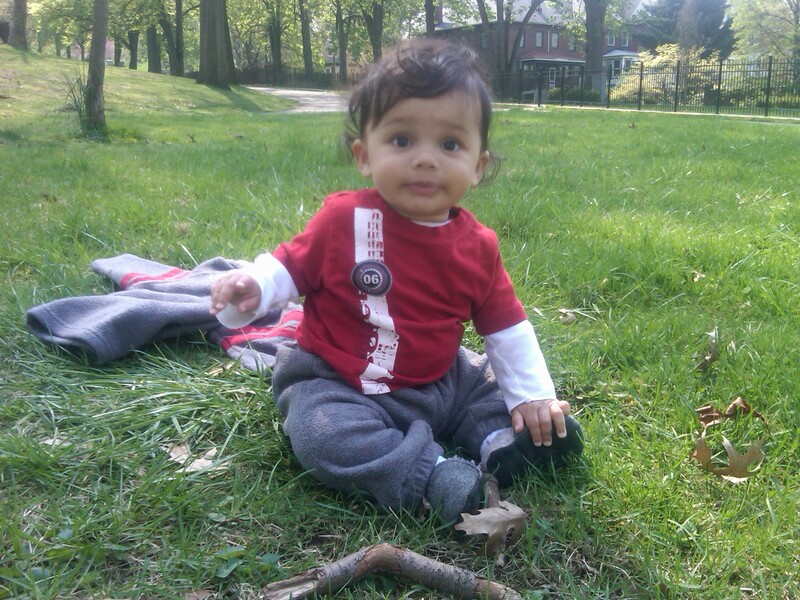 So two lessons learned – baby goes in a shaded stroller most of the time (unless crying) and I always, ALWAYS where my work boots! We did manage to get most of the beautiful and luscious Fruit & Herb Garden weeded and shaped. This circular garden is filled with an ever expanding, twice-blooming red rasberry bush, a strawberry patch, a blackberry bramble and some luscious herbal ground covering including: oregano, thyme, egyptian mint and sage! Sweetness! I am pausing on posting pics until it is done and complete. 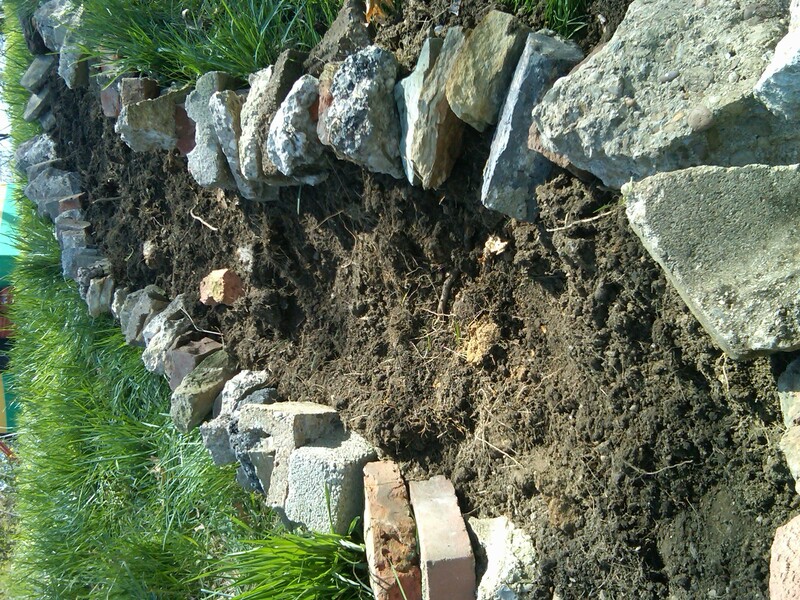 Our dear community farmer Jahques is planning on tearing up the current brick path and patio, adding ground cover and repaving – bless his heart. But Jah is ever great and good and timely when your heart is calling. I planned on mowing the lawns today, got out that lawn mower and did it all as my dear father taught me – oil and gas had been drained before winter – I filled them all back up with new and fresh product, pumped the ignitor and off it went – until soon smoke was pouring out and it sputtered to a hault. Come to find that the gas was leaking into the air filter and out onto the base of the cutter…darn it, says Mama, this is where my skills fail me – I have no mechanical/machinery skills – in fact – I am down-right lazy when it comes to fixing machinery. I would sooner pay the money and take it to the nearest mechanic than figure out how to make it work again. Well just as I am saying this and look at the clock tick til its time to pick the baby up from daycare and boom! Jah drops a skilled and generous Fari right onto the property – well he drove up on his bike. Prentiss, mechanic and DJ extraordinaire does a tap-tap on the air filter thingy and boom, leak stops! Still no grass cutting cause I need a new spark-plug and air filter to really get that mower in tip-top shape – but all cards are out on the table and everyone is ready to go! Seedlings are growing like crazy and the season has really begun. We have a great spring weather here – a nice mix of rain, a little chill, some very warm sunny days and everything has started to sprout! 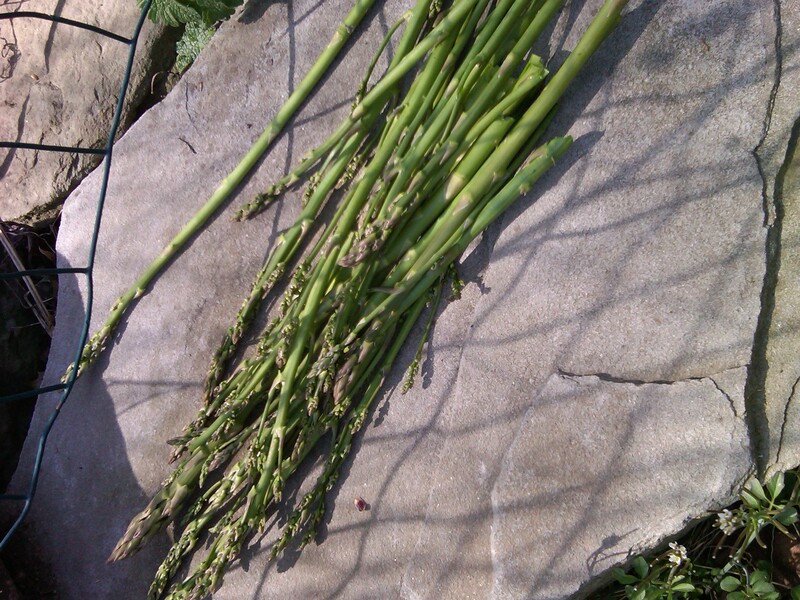 Lavender and sage are budding for the season and we picked our first harvest of asparagus – oh so sweet and crunchy! Today’s adventures include showing our dear friend Niko Gomez, constructor extraordinaire, the plans for the green house endwalls. He will help us finish our 40’x17′ hoophouse off with enclosed, double-door walls so that we don’t have plastic ends – and more for the local kids to have fun ripping to shreds! The perils of urban growing…. Also our beloved community farmer here for his 2nd year of growing, Jahques, helped dig out a new flower bed and cover up some knotweed. The best part though is that while he was swinging that pic-axe my 6 month old son, Negus, gave us 5 solid minutes of belly laughing, as that was the funniest thing to him!!! 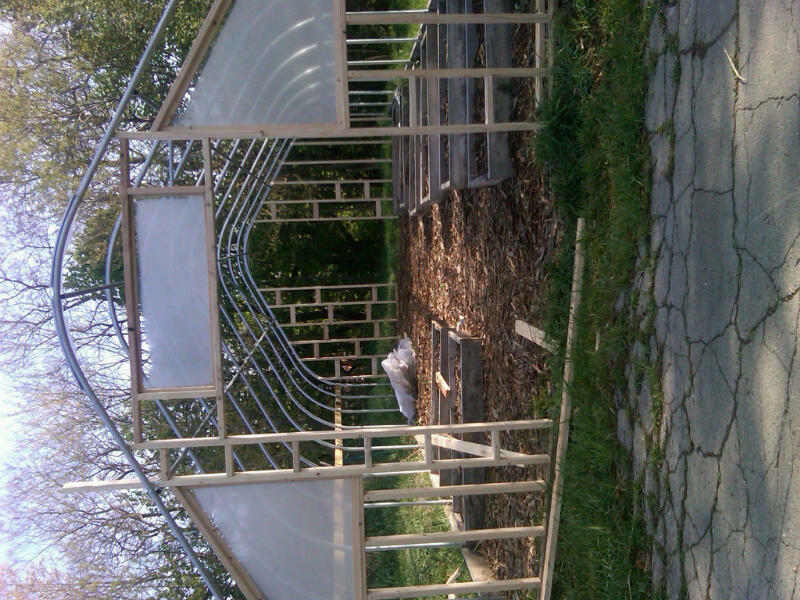 So we are on our way with springtime preparations and ready for our 5th year of urban farm fun! I wanted to thank all of you who have come out so far to support our work. Each and every person who has given time to prepare the gardens for spring planting have been a tremendous support. For all those still interested in creating community around local food and farming – there are big things ahead for Healcrest- and you are never too late to get started. Do you need a space to grow your own vegetables? Are you looking to connect with other gardeners – be it gardening mothers and children, interesting neighbors who love local food, environmentalists and health advocates, regular working folk of young and old who want to connect and grow together? 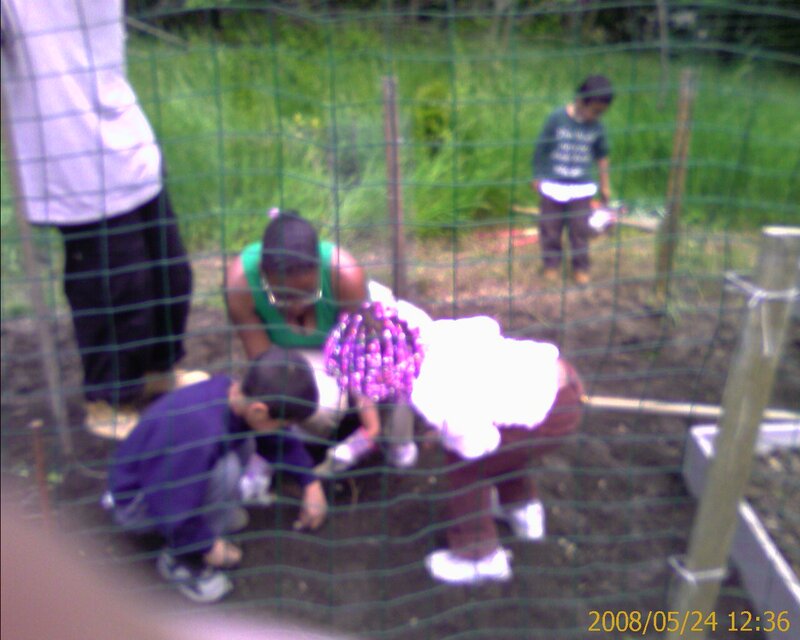 There are a diverse group of people who join us every year to grow food together. …and just let us know you would like to join us as a Community Farmer – and tell us which open day you are coming out! From there we can get growing together – for your family, ours and the whole East End Community.